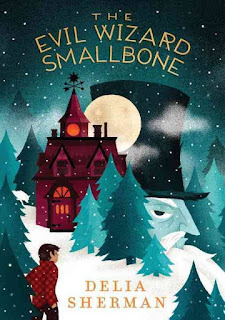 My second read for the RIP XI Challenge was The Evil Wizard Smallbone, a new middle grade fantasy tale from Delia Sherman (out on September 13). It's the story of twelve-year-old Nick, an orphan who lives in an abusive home with his uncle and cousin. He finally runs away in the middle of winter only to collapse on the doorstep of Evil Wizard Books, domain of the Evil Wizard Smallbone. Once Nick is there, he's trapped by the wizard and the wards around the shop and town of Smallbone Cove that keep away the evil French loup-garou, Fidelou -- a wizard-werewolf hybrid. If Nick could only find a way to learn a little magic of his own, he might finally get the safe life he dreams about. With a setting in rugged, coastal Maine and many unexpected twists and turns and changes of character, this story is quite the adventure. Nick is surly and reckless but also earnest and determined and I very quickly found myself rooting for him. His relatives are truly horrid, almost as bad as either of the wizards, which was reminiscent of Diana Wynne Jones. I greatly enjoyed the magic system in the story, especially the way Sherman dealt with transfiguration. And I'll let you in on a little secret -- the bookshop is magical! By the end, I was reading as quickly as possible, hoping for the best but never quite sure where the tale would go. This tale has as much adventure in it as it does heart. The cover is the best! Another beautiful Candlewick book. I love how they give artistic attention to their books for older readers too. THIS COVER, oh my gosh. 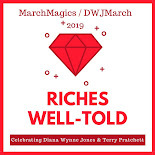 I don't read a ton of middle-grade books buhttp://webereading.com/search/label/autobiographyt you are reeeeeally tempting me here! I like the sound of this one! A good book is a good book, and when an author can write for children and appeal to adults--that the best! The cover makes me think of Kate Milford's Greenglass House (I guess it's the house and the snow). All I needed to know was magical bookshop, and I'm in! This sounds like a winner. I'm looking to build up my library of mid-grade books for the kiddos. I'll look for this one. I'm sad that we're starting to dismantle our middle grade library. Where does the time go? !